The Zype Data Protection Compliance Manager is responsible for ensuring compliance with Privacy Law and with this policy. Any questions or concerns about the operation of this policy should be referred in the first instance to the Data Protection Compliance Manager – Address: CitNOW, Millars Brook, Molly Millars Lane, Wokingham, Berkshire, RG41 2AD. Telephone: 0118 997 7740. If you consider that this policy has not been followed in respect of personal data about yourself or others you should raise the matter with our Data Protection Compliance Manager. (a) Processed fairly, lawfully and in a transparent manner. (b) Processed for specified, legitimate and specified purposes and not further processed in a manner that is incompatible with those. (c) Adequate, relevant and not limited to what is necessary for the purpose. (e) Withdraw their consent to processing at any time. (f) Request individual personal data in a portable form. (g) Lodge a complaint with a supervisory authority. We shall maintain a record of all categories of processing activities that we undertake including, the nature of processing and, where applicable and where permitted, details of transfers of personal data to a third party (sub-processors). If applicable under Privacy Law, we shall make such records available to a supervisory authority upon request. We will ensure that appropriate security measures are taken against unlawful or unauthorised processing of personal data, and against the accidental loss of, or damage to, personal data, including taking reasonable steps to ensure the reliability of our employees who may have access to personal data and will ensure that such employees are subject to appropriate confidentiality undertakings. Data subjects may apply to the courts for compensation if they have suffered damage from such a loss. Details of our IT security measures are set out in our IT Security Policy. (a) Check the caller’s identity to make sure that information is only given to a person who is entitled to it. (c) Refer to the Data Protection Compliance Manager for assistance in difficult situations. No one should be bullied into disclosing personal information. In addition to our obligations set out in this policy, Our data protection position specifically relating to the provision of CitNOW is set out in our GDPR Statement for CitNOW Retailers below. 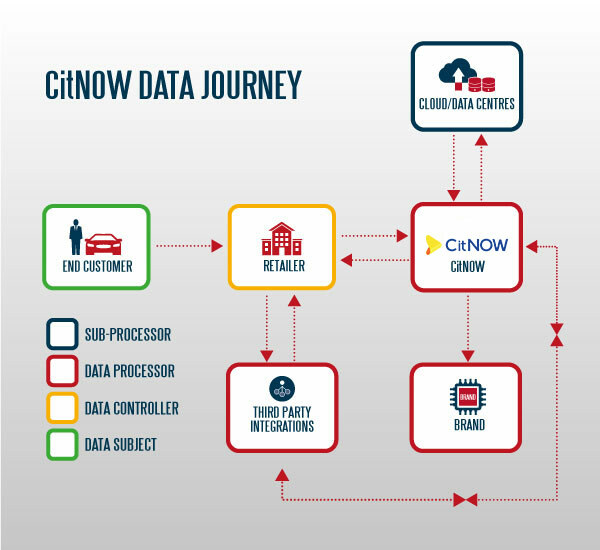 In providing CitNOW services to Retailers (Our customers) we are acting as a data processor and Our customer is the data controller, both as defined by Privacy Law. In this statement, as data controller Our customer is referred to as “You/Your” and CitNOW, as data processor is referred to as “We/Us/Our”. We have outlined below Our responsibilities as the data processor and Your responsibilities as the data controller in providing CitNOW services to You and Your data subjects (“Consumers”). As a point of clarity, the data that we use in the CitNOW service may constitute personal data as defined by Privacy Law, but is not deemed sensitive personal data. It is Our responsibility to ensure Your data is kept safe and we have a comprehensive IT and Security Policy which details what measures we take to ensure the security of the data. Our sub-processors may not transfer data outside of the EEA without Our permission. We have defined Our Online Services (Our dashboard and reports) in Our factsheet. We only grant access to Our Online Services to Your employees and representatives that You notify to Us (“Authorised Users”), including the setup of a “manager” role for at least one of Your Authorised Users. Once access to CitNOW is granted to a Manager, the Manager will be responsible for actioning the addition and deletion of any further users requiring access to CitNOW. All Authorised Users and Managers will receive training on the use of the CitNOW dashboard. Data is also shared with brand owners and vehicle manufacturers via Our Online Services. This includes information regarding Your use of the CitNOW service as well as personal data we may collect as part of the CitNOW service. Brands are required to nominate Authorised Users to access the Online Services. We have appropriate arrangements in place with brand owners and vehicle manufacturers to ensure their compliance with applicable Privacy Laws and to prevent them from processing any personal data which they may see via Our Online Services for any reason other than reporting and analytics. We may also use Your videos for the purpose of demonstrating the CitNOW service i) within Your dealer group and ii) with the vehicle manufacturer. You agree that we may use such materials for this purpose. e) Whilst CitNOW will consider all requests for Content retrieval, we cannot guarantee successful retrieval of Content following termination. CitNOW will not market directly to Consumers unless We receive an express instruction from You for a specific purpose and confirmation from You that necessary consents have been sought. Should a Consumer wish to exercise their right to be forgotten, We will facilitate such request. a) When a video is sent from the service department as part of a service: In this scenario personal data is required in order to process their car for a service. b) When a video is sent from the sales department as a result of an enquiry: In this scenario, personal data is gathered in order to respond to the customer with details of a vehicle they are interested in purchasing. Consumers should be made aware that the specific examples above are necessary for the day to day operational running of Your business and that their personal data is used for this purpose. It is Your responsibility to ensure that you have a clear policy for data use and data retention once You have used personal data for its original purpose. You should be aware that unsolicited videos – for example, sending a Consumer a video to promote a new car offer when they have not specifically asked for it – would count as marketing under GDPR regulations and in this scenario, the Consumer should have given their express consent to such communication. You are also responsible for advising Your staff that the use of their personal data in the CitNOW service is part of the general operational running of Your business and for gaining their consent to such use in the appropriate employment agreements with them. You are responsible for controlling access to any personal data collected by the CitNOW services and for ensuring each individual working within Your organisation and having access to personal information is aware of, and complies with, their obligations under the applicable Privacy Law and this policy. User names and passwords must not be shared. You acknowledge the nature of the service we deliver and You warrant that You have sought the necessary consents set out in section 2.1 above and give us permission and authority to gather, store and share Your data in line with this statement.